A very special acknowledgment goes out to Keen for the archive of materials that contributed to this article. 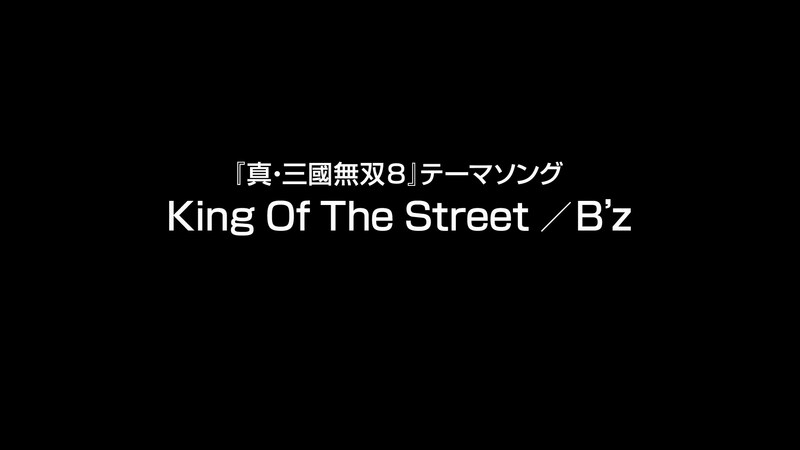 A great debt is owed to her not only for this article but for supporting international B’z fandom from its infancy. Aerosmith formed nearly two full decades before B’z and, by the time Tak Matsumoto and Koshi Inaba made their joint debut on September 21, 1988, had already sold well over 25 million records worldwide. “Dream On”, “Sweet Emotion”, “Walk This Way”, “Mama Kin”, “Back in the Saddle”, and “Draw the Line” had all long been released. Already commonly hailed as both the “Bad Boys from Boston” and the definitive American rock band, Aerosmith had by then already toured the world, broken up and spent a half-decade without its core line-up, reunited, battled drug addiction, and earned a reputation as both the hardest rocking and most volatile band around. The group’s biggest personalities and likewise its brightest stars—vocalist Steven Tyler and guitarist Joe Perry—earned the joint moniker “the Toxic Twins” as a result. So distant were these two bands in age that B’z guitarist Tak Matsumoto spent his high school years playing Aerosmith songs in his bedroom, whilst a young Koshi Inaba considered Steven Tyler a top vocalist whose ability and stage presence were to be striven toward. What the two acts undoubtedly have in common is success: both topped their respective music industries, both established themselves as definitive rock icons whose staying power is long beyond reproach. 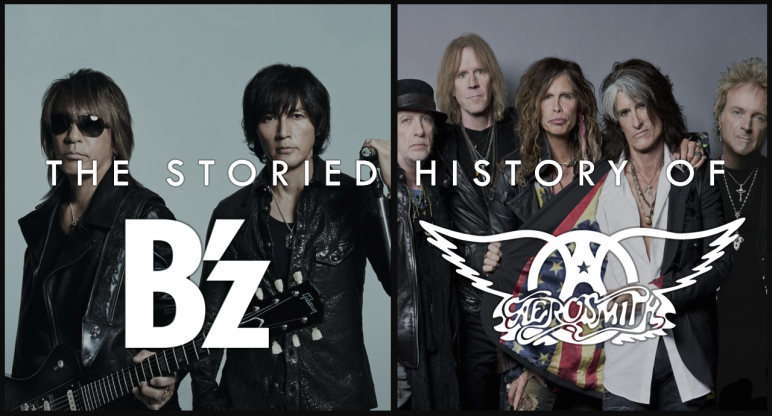 What’s more, despite the different eras from which they hailed and the ages that separate them, the divergent paths of B’z and Aerosmith would later intersect in a way that would make rock history and prove an indelible moment for fans of both bands. 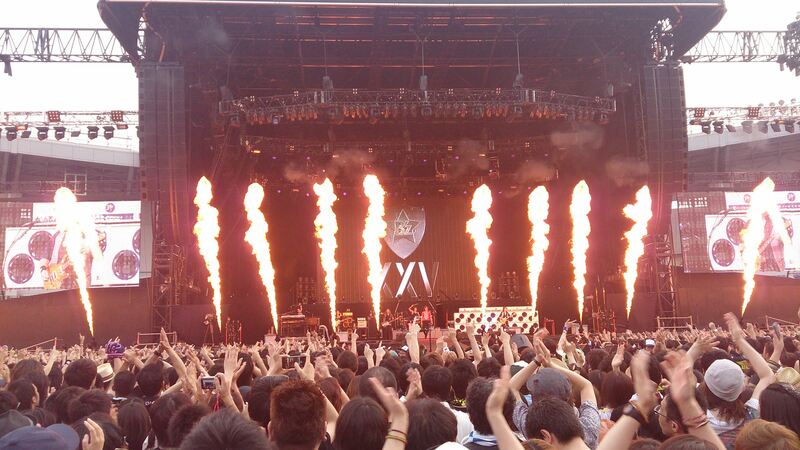 Where there is B’z, there are flames and fireworks. 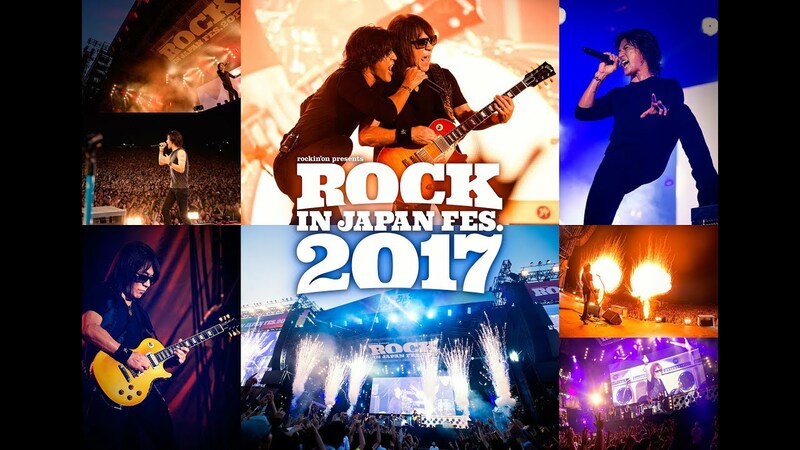 B’z and Aerosmith have heated up about 34,000 rock fans at the QVC Marine Field last night at the two band’s special event called AEROSONIC. B’z kicked off the event by rocking the stage first. The band performed 16 songs with fan favorites such as ultra soul, ZERO and Ichibu to Zenbu among them. After a while, the “main act”—this show was part of their Japan tour—went on stage: Aerosmith! 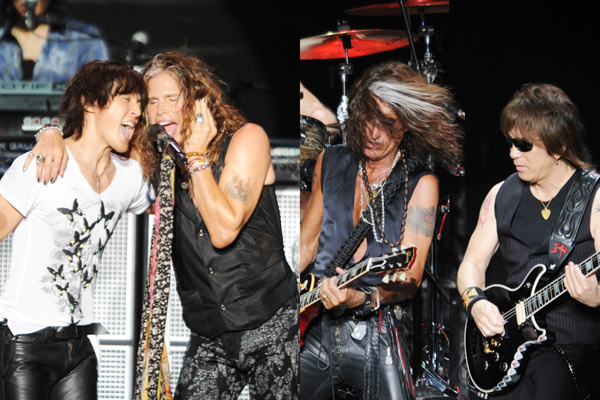 Aerosmith performed 17 songs in total, one of which, Mama Kin, was performed with B’z as guest on stage! The massive gig with B’z and Aerosmith is just around the corner and so the official merchandise has been posted on B’z official website. The merchandise posted there is just the B’z side of the available merchandise. You will be able to buy merchandise although you do not have a ticket. 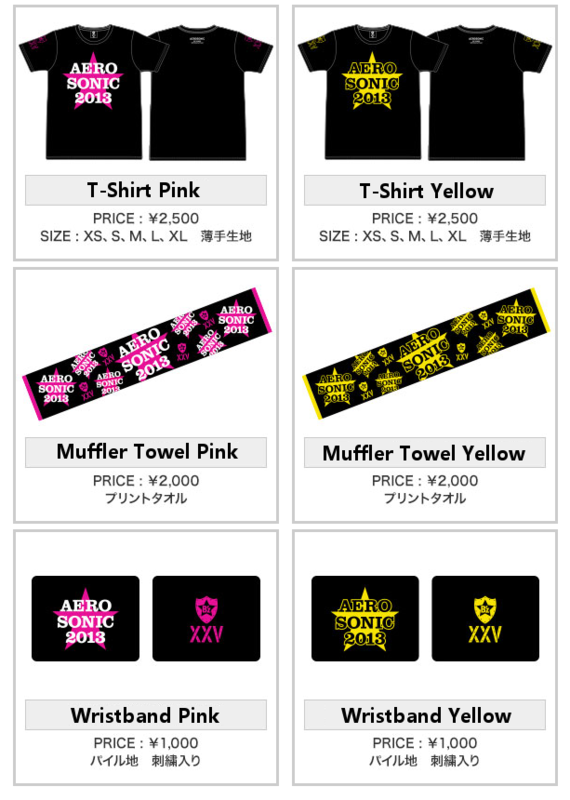 Unfortunately the only type of credit card they accept is B’z Party’s Vermillion Card, so you will have to resort to paying in cash if you are looking to buy one of the items shown below. 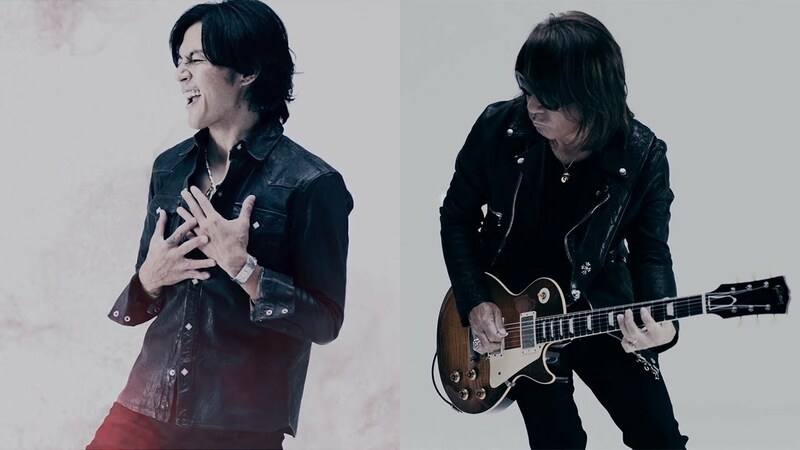 B’z have announced that they are going to perform live on stage with Aerosmith on August 8th, 2013 in Tokyo. The event is called Aerosonic and will be held at the famous QVC Marine Field, which is located within the Stadium of the Chiba Lotte Marines, a Japanese baseball team. Tickets are going to be on sale June 9th. Fanclub tickets are also said to be available through B’z PARTY. 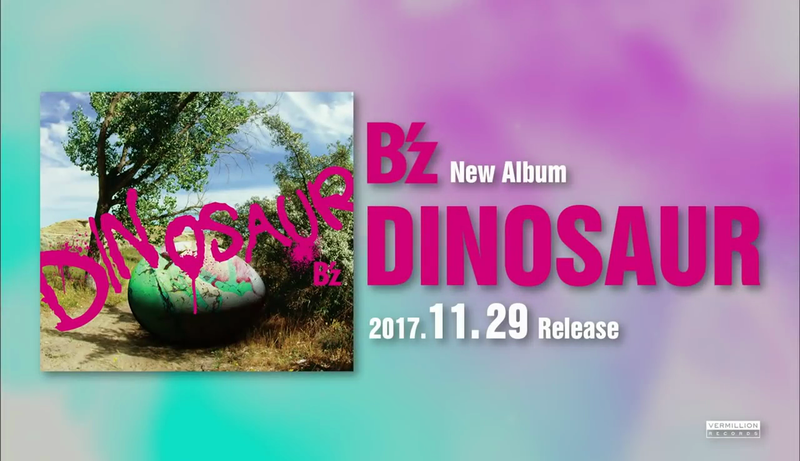 This is not the first time for B’z to team up with Aerosmith. 11 years ago, during the 2002 FIFA World Cup, Aerosmith was joined by B’z on stage to jam out to Train Kept A Rollin’. 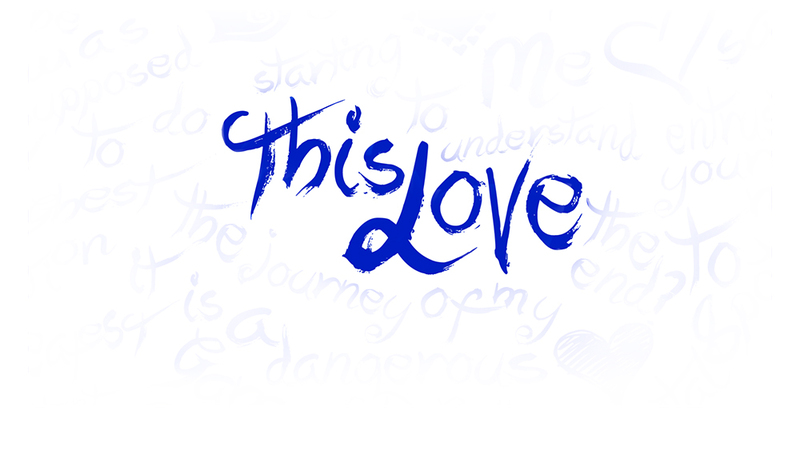 Check it out here if you missed it!